Somebody once told me that I cannot write a blog entry on bringing a book to a social gathering without being seen as a nerd, but—let’s face it—I read until I needed glasses, and I blog about literary concepts. Although I would not consider myself a complete book worm (see The Average Reader), there have been instances when I’ve spent time around people and wished that I had brought a book. I wouldn’t venture to say that I am always uncomfortable at social gatherings. Quite the opposite. I can have a good time if I’m with the right sort of people. Nevertheless, I enjoy bringing a book just for those lulls in events when I find myself watching everybody else having a conversation or doing something else. During one particular Thanksgiving, we had a wonderful celebration, and I brought along Illusion. After our meal, I read while most everybody else either took a nap or watched football. During certain occasions like this, I would consider myself justified to bring along a book. After all, I cannot be expected to engage in conversation at every moment. 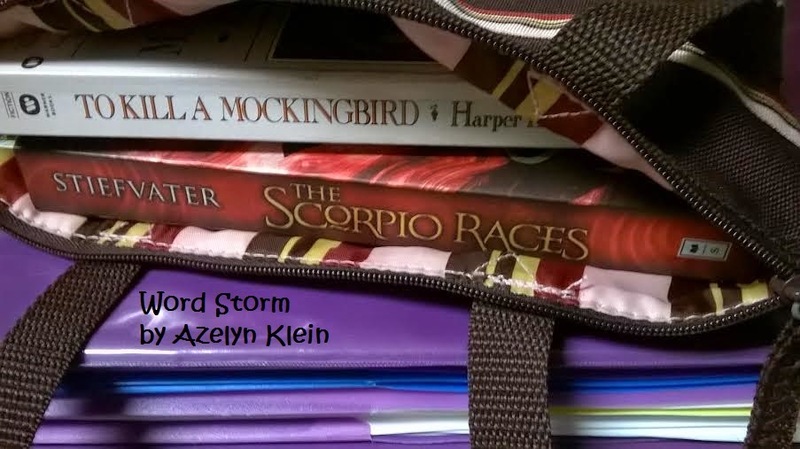 Recently, one of my friends brought her copy of To Kill a Mockingbird to a talent show. Although she didn’t actually read during that event, it was a comfort to have the book on hand. Some books for my young adult literature class. Even writers are encouraged to always bring a notebook or some sort of paper everywhere they go so that they may take notes or capture random bursts of inspiration. Although I do not always carry a notebook, I try to bring a pen, or I may text myself if something comes to mind. The most common thing I record are interesting quotes because I won’t remember them later word-for-word. When it comes to general concepts, I keep these in mind until I have a chance to type them up on my computer. More often than not, if I bring a book, I may not use it, but if I forget it, I will want it. I attended social gatherings with friends weekly, but I do not bring a book with me. I would, and still do, engage in conversation, but that does not stop me from browsing bookshelves. Overall, people may still be able to socialize while they have a book on hand. I primarily carry a book along while I’m travelling, especially if I’m not the one driving. It is even enjoyable to read one book while the person next to me—be it friend or family—reads another. Even when I went horseback riding, I would sit in my horse’s pen afterward and read books such as Huckleberry Finn and The Hobbit. I don’t always bring a book everywhere I go, but I’d like to. What are your thoughts on bringing a book to a social gathering or event? Do you often carry a book around? Literary references: Frank Peretti’s Illusion, Harper Lee’s To Kill a Mockingbird, Maggie Stiefvater’s The Scorpio Races, Mark Twain’s Huckleberry Finn, and J.R.R. Tolkien’s The Hobbit. Bring prepared with a book or something you are working on is, I think, being a good steward of time when extra time is available.